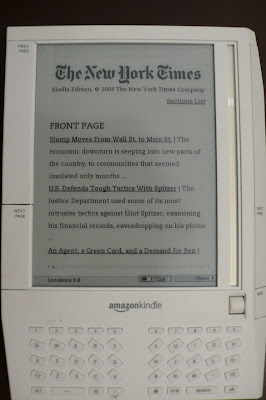 I'd been curious about Kindle and waiting for someone whose opinion I respected to weigh in on it. Since I always seem to remember that I forgot to get a new book as I'm lying down in bed for the night, Kindle will prove invaluable. Glad you found it of use, Toad. Many happy bedtime stories to you. One thing i forgot to mention--it comes with a black leather bookcover case but I sprung for the (lighter) woolen slip cover pouch in burnt orange, which I love. Or you might want to check out the new neoprene black pouch. Complete with nerd-approved belt clip. I'm glad you read that whole Kevin Pereira post -- I thought it was just so hilarious with all the emotional highs and lows. When Pereira first reviewed Kindle on his show (G4's Attack of the Show), he was only lukewarm so it's interesting that just a few weeks of use can turn someone into such a fan. My bet is he doesn't swear off Kindle. I get the convenience factor, but have we forgotten about public libraries? You're kidding, right, Auntie? I've had a book on hold at NYPL since 1985.